You should see the shelf in my bathroom. I mean, really... You should see the shelf in my bathroom. I keep most of my skin care at my vanity to protect delicate actives from heat and steam, but I do keep my cleansers in the bathroom and I have A LOT of them. I would even hazard to say that I'm becoming a bit of a cleansing junkie and I tend to choose my cleansers based on how my skin is behaving and what I feel like it really needs. 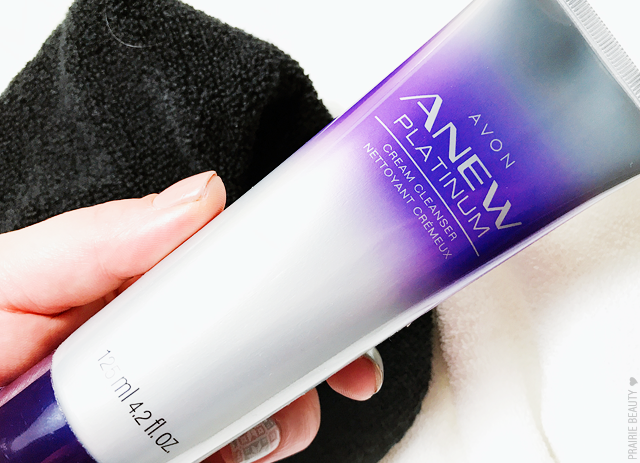 Recently, I added the Anew Platinum Cream Cleanser* to the rotation. 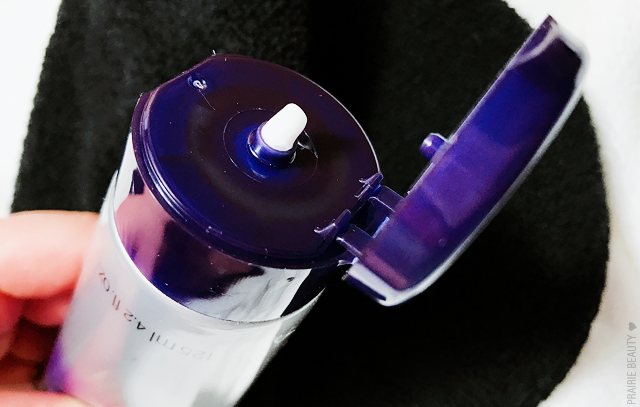 For my thoughts on this cleanser and how it fits into my collection, keep reading! Now, I recognize that one human does not need a dozen or more different cleansers, but I don't think I could go back from really having options. Of course, I have my cleansing oils and balms for removing my makeup, and then I have different types of second cleansers for different skin situations. This cleanser definitely fits into the category of second cleanser for me, which are the ones I use either after an oil or balm at night or as my only cleanse in the morning for the purpose of really cleaning the skin. 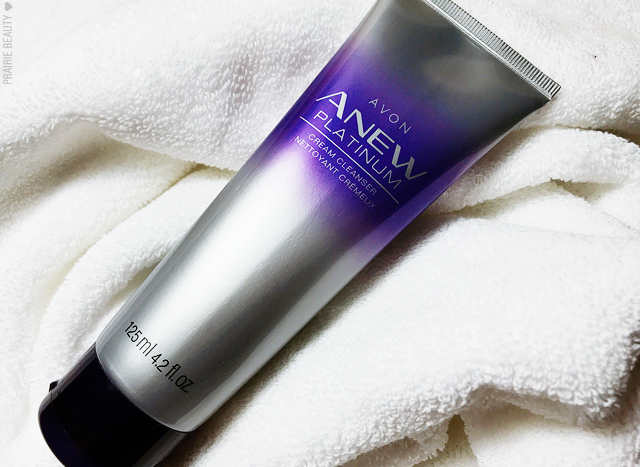 The Anew Platinum Cream Cleanser* is recommended for AM and PM for normal to dry skin. It's alcohol and oil free. And it is clinically shown to be effective in protecting and maintaining skin's moisture barrier. Honestly, for me, I absolutely, 100%, without question need a cleanser that isn't going to damage my moisture barrier - which I learned in a very, very unfortunate way with a (far too) popular cleanser that took me literally months to recover from. I actually think that might be why I'm such an obsessive when it comes to cleanser formulas. 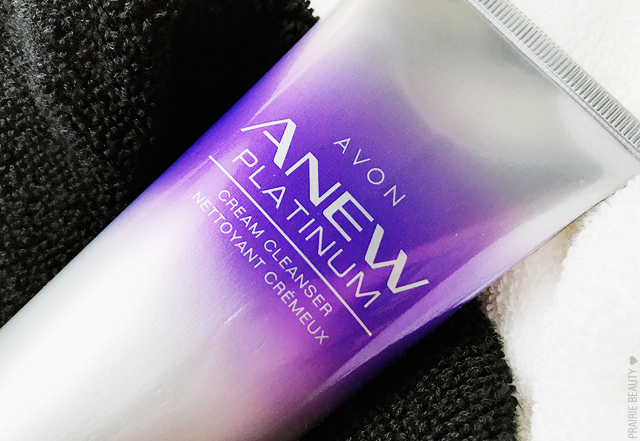 The texture of this cleanser is, as you would expect, quite creamy. It does have a smell.... but I would say that it's a kind of standard cream smell. I like to apply this on slightly damp skin. I find that if my skin is too wet, this will just sort of slip around too much and I don't feel like I get as successful a cleanse. This is not a foaming cleanser, which is always a plus for me since foaming cleansers generally make my skin feel awful. I massage it into the face for a minute or so, which feels absolutely lovely because of the smooth, creamy texture, and then I remove it with a warm, wet wash cloth. I think that removing cream cleansers with a wash cloth gives me the best results, because I feel like they don't leave a bunch of residue on my skin that way. After removing this cleanser, my skin feels absolutely lovely. I can really feel that it's hydrated and almost plump, but it also feels clean. For me, this is generally a cleanser that I like to use at night, though I've had good results with it in the morning as well. It's also one that I'll reach for if my skin is looking or feeling particularly dry, an all too common occurance during the cold, dry prairie winters. I think this cleanser is a little bit of a gem, I have to say, particularly for dry or mature skin, and I think it's one that I'll actually be recommending to a few women in my life. Like I said above, this isn't a foaming type cleanser and it doesn't leave my skin feeling stripped. For me, that tight, dry feeling that I used to associate with being clean is just not something I want anymore, because ultimately it's really bad for my skin, and the fact that this leaves my skin feeling clean but hydrated is a huge plus. This cleanser gets two thumbs up from me and I'll definitely be passing along info about it to more mature, dry skinned women in my life as a good option. 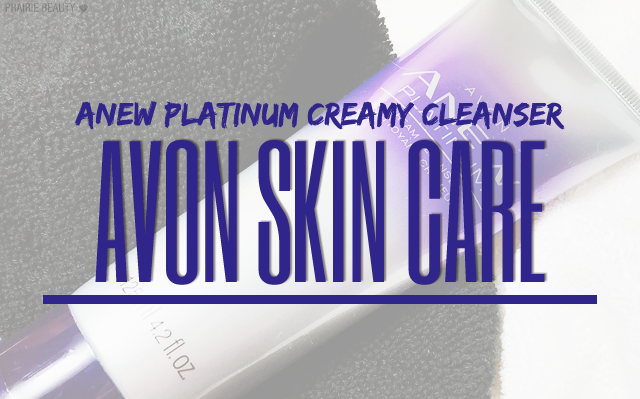 As ever, the Anew Platinum Cream Cleanser* is available from your local Avon representative. For more information and to find a rep, visit Avon.ca (or Avon.com)!